We became suspicious about meteorological impact trajectory. I reacquainted myself with every broken bone on my body. I napped. Like the dead. I awoke and served ice cream instead of dinner. We critiqued network “panic graphics” and sizzle intros. We let the hamsters roll around the house in their balls. I drank wine with allergy medicine and advil. We let Bryant go get Chinese food in the middle of the storm. I saw a picture of my mother drinking a beer at a hurricane party on Facebook and turned it off completely. Watched the Weather Channel fail to compete with the victims of the storm. We listened to the police scanner. We resisted the urge to watch the movie 2012 on demand. We got really bored and went to bed. We awoke at 5 am and noted the wind. We went back to bed until 10:30. 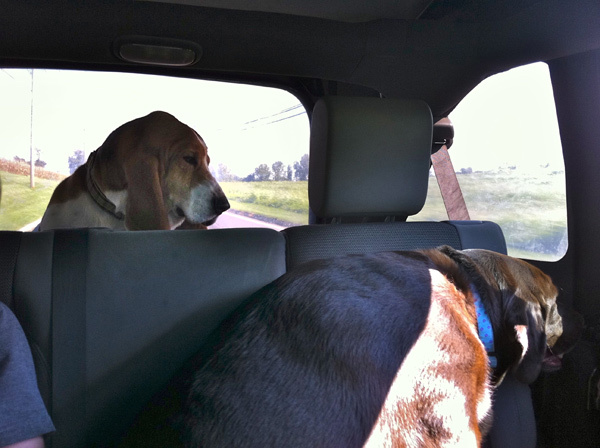 We got everyone in the car after Cheerio’s and headed to our friends farm to see if they had damage. We noted that the large dog was affected by the storm and was hiding his head a lot. We watched Bryant *actually help people on ladders and with tools. We noted that the small dog was unaffected by natural disasters of any type. We had a small dance party to Maroon 5. We started a new book (written in 1924) during shorty’s bedtime bath. We critiqued the new *fancy soap. Debated what the ingredients of toothpaste were. We chose BBQ Pitmasters over Weather Channel.